Risotto al Barolo: Risotto is an Italian rice dish cooked in broth to a creamy consistency. The broth may be meat-, fish-, or vegetable-based. Many types of risotto contain butter, wine and onion. It is one of the most common ways of cooking rice in Italy. 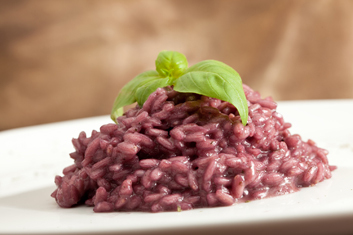 Risotto al Barolo is made with red wine and may include sausage meat and/or Borlotti beans. In a wide, deep skillet, heat oil until very hot but not smoking. Add the chopped onion to the skillet. Cook the onion, stirring, until softened and translucent, takes about 8 to 10 minutes. Add the rice to the skillet. Stir with wooden spoon till the rice is opaque and slightly toasted. Add the wine with a ladleful of hot stock to the rice. Cook the rice, stirring often, until all the liquid is absorbed. Continue adding and stirring hot stock a ladleful at a time, always waiting until liquid is almost completely absorbed before adding more. Cook until the rice is al dente. The rice should be tender and creamy (but not mushy), takes about 20 minutes. Toward end of cooking time, the rice will soften quickly, so stir constantly and taste often. Remove the Risotto al Barolo from heat. Season the Risotto al Barolo with salt and black pepper powder. Risotto al Barolo is ready to be served. Serve hot with additional grated Parmesan. Note: Traditionally, risotto is served as a primo or first course. Sausage or Borlotti beans may be added for a more robust variation. Cook your sausage or beans separately, and then add to the risotto mixture at the same time that you start adding the broth.